As I mentioned in my New Year's Eve blog post, I got a fantastic Christmas gift this year (well, last year, to be technical): a Canon EOS Rebel T3 (EOS 1100D) DSLR camera. For regular—or even casual—readers of this blog or my Facebook feed, it should have been painfully obvious where I would almost immediately be heading to put this beauty through its paces: the Zoo. Sarah and I went on a little "walkabout" last Friday not long after the new (and first) snow of the Toronto winter had fallen and from the very first impressions I can honestly say that I am going to love this camera for a long time. I had an old Ricoh 35mm SLR for nearly two and a half decades which gave up the ghost in late 2003 (sadly, it was on a trip to the maritimes and the disposables I had to buy to fill the gap were really quite terrible). In the years since that loss I have made do with a series of crappy-to-decent point-and-click digitals (the most recent of which I actually won in a radio promotion a few years back) and, having abandoned thoughts of obtaining a DSLR for myself (out of my price range), I had my eyes on a Nikon Coolpix P500 that I was thinking of buying used from a friend of mine. Great little camera, but at the end of the day it's still a point-and-click. So when I opened my new Rebel on Christmas (and Sarah unnecessarily apologized for not getting me the Nikon!) I was absolutely thrilled; however, it wasn't until I actually took some pictures with it that night and viewed them on the computer that I realized just how much better my photo-taking life had just become. Over the following couple of days, as I read up on the functions and settings of my Canon, the old feelings started to come back and I realized how much I actually missed my old Ricoh and, consequently, how much I had pushed that to the back of my mind for the past 9 years. From the Tundra Trek it was off to the African Savannah where I hoped to get a glimpse of one of the brand-new penguin chicks that hatched over the holidays—there were five in total! I have gone to see the penguins on every training day at the Zoo and a couple of weeks earlier had been rewarded for my perseverance with a quick peek at a beautiful little egg in the nest just below the viewing window when the parents switched duties so the mom could go grab some food. 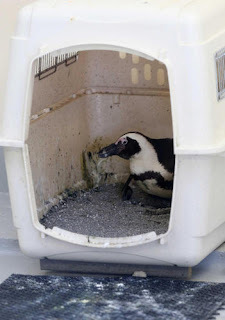 Last Friday I pressed up against the window and fixed my attention on that very same crate and the nest within it, hoping against hope that a similar event would take place. It wasn't feeding time, but there was a keeper in the enclosure hosing down the mats and the floor which kept the penguins hopping around to stay out of her way. All of a sudden the parent sitting on the nest right below us shifted forward enough so that we could just make out two unbelievably wee webbed feet kicking at the air and a little ball of soft, black downy feathers curled up right behind its parent's tailfeathers. It was so thrilling (but, alas, no chance to take even a bad photo) and was by far the youngest penguin chick I have ever seen in real life (somewhere between one and three weeks old). I got the keeper's attention (I've met her—I believe her name is Lisa—a couple of times, once notably after the pictures I took for a blog post last year) and asked her, mutely, how many babies there were in that nest. She indicated that there was only the one, but then she tucked the hose under her arm and put her hands close together to indicate just how tiny the little thing was. I put my hand over my heart and mouthed, "So cute!" She silently responded, "I KNOW!" with a huge grin on her face. I stood there a while longer, hoping to be rewarded a second time but there would be no more chick sightings on this day, so we moved on. We passed through the Indomalayan pavilion to visit with the orangutans and gibbons for a while (no good pictures to share) and wound up at the Indian Rhino building as our final stop where I spent some time with my new best friend, Ashakiran. In mid-Decemeber, my Volunteer mentor, Glen, signed up to run a "Behind the Scenes" tour and I asked if I could shadow him as part of my training. Luckily my co-ordinator agreed to my request and I accompanied Glen and a group of ten Grade 8 students as they visited with the giraffes and the Indian rhinos. Now, ordinarily the Volunteers stay out of the way while the keepers are giving their talks to the kids on a BTS tour, but I think this particular keeper—John Armstrong, who has been at the Zoo since one month after it opened back in 1974—sensed my excitement and insisted that Glen and I feed some carrots to Asha along with the rest of the group. This would have been amazing enough, but the real treat came a few minutes later. I had taken up a position slightly away from the group and behind Asha so as not to interfere when she decided she was bored and spun around 180 degrees to face me. She pushed her huge head through the widely-spaced fence rails and, using her prehensile lip, gently took hold of the hem of my winter coat and tugged at it. Without giving it much thought, I reached down and pried my coat out of her mouth, telling her that it was not for her to eat. I then began to rub the nub of her horn (as you can see in this picture, it broke off a while ago and is slowly growing back, like a fingernail for us) and the bridge of her nose and then moved to below her right eye where I began to skritch her skin a little bit. She closed that eye nearly completely and subtly pushed her head against my hand to encourage me to keep up the attention, which I did for quite a few seconds before the enormity of the situation hit me like a ton of bricks: this is a rhino. It's not a goat or a lamb or Addie, it's a rhino, a two-and-a-half ton wild animal that could crush me like a bug if I frightened or angered her. And I was petting her. And she liked it. What a profoundly moving experience that was, far beyond my capacity to do it proper justice with mere words or after-the-fact pictures. But even more important that my own reaction to the events in that rhino enclosure was this: on the walk from our encounter with Asha to see the giraffes, our little group of ten young people, one teacher and two Volunteers walked for several minutes with nary a sound being made by any of us, while we processed what had just happened. Ten Grade 8 students went home that night and I guarantee you that all ten of them told everyone they knew that they fed and stroked a rhinoceros at the Toronto Zoo earlier in the day. When I was exactly their age my friend's dad—the newly-hired comptroller of the as yet unopened Zoo—was entrusted with fostering (briefly) two black bear cubs (and later a cheetah cub) in his own home while the facilities were still being built. I spent many hours at their home interacting with these beautiful little cubs and it informed the rest of my life; I hope that most, if not all, of the ten young people with us to meet Asha have been given the same emotional gift. This week there are no classes as our Christmas break continues. I will likely go to the Zoo anyhow, because there is still so very much to learn about the animals and the grounds before I am entrusted with leading my own tour in the spring. On January 11, I have to give a short presentation on the animal or plant of my choosing; I have decided to go with the white-handed gibbons as if I was leading a Biodiversity tour for Grade Sixes. A couple of weeks ago that prospect had me quite nervous; however, the time I have spent shadowing Glen and Brian has given me a lot more confidence and I am actually looking forward to it now. I think I might go to the gibbon enclosure this Friday and practice my little talk. Or maybe I'll wander over to see if Muna, the babirusa piglet, has finished eating that enormous Christmas tree in her enclosure! And, if I'm very, very lucky, when I visit the penguins (as usual) I may finally get a chance to grab a photo of one of the chicks. You'll be the first to know! Someone told me it's all happening at the zoo! I do believe it! I do believe it's true! The zoo really is so wonderful in the winter. Although the zoo could certainly use more visitors, part of me is glad it's such a secret! Me too, selfishly. I love being able to commune silently with some of the animals there in virtual solitude. We had a great time at the zoo yesterday! As you said, Steve, it was not crowded at all, and the pavilions were a great place to warm up. Unfortunately, one of our kids just got too cold and cranky for us to see everthing we wanted to see, so we went home after about three hours. Still, it was worth it! Cynthia, at three hours you are actually doing better than the year-round "average"! You'll never get to see everything in one day there anyhow and especially not once Eurasia opens again next year (complete with the pandas). Do you guys have a membership? For anyone else reading this comment: if you plan to go more than once in any one year you definitely should get a membership because it's roughly the same price as two visits (last time I checked).